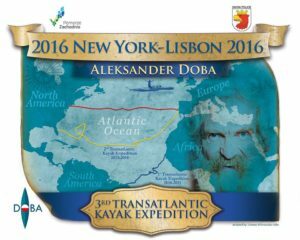 Aleksander Doba crosses the Atlantic in his kayak for the third time! 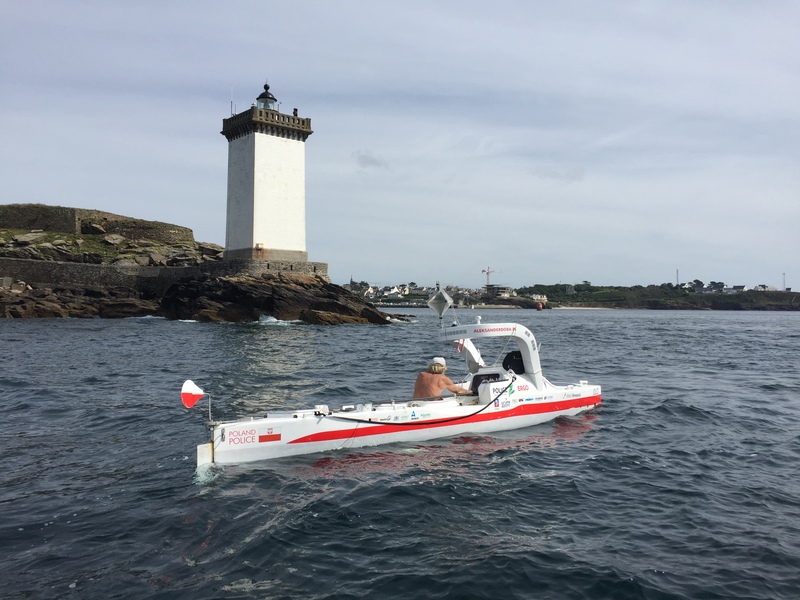 On September 3, 2017 at 12:45 pm in Le Conquet, about 30 kilometers from Brest, France, Aleksander (Olek) Doba officially ended his Third Transatlantic Kayak Expedition. It was not just coincidence that landfall happened at a quarter to one in the afternoon – at exactly the same time he had left on May 16th from Barnegat Bay, New Jersey, in the United States. During his expedition, he had covered the North Atlantic route of about 3,000 nautical miles, measured in straight line, but in fact, he had paddled over 4,150 miles. 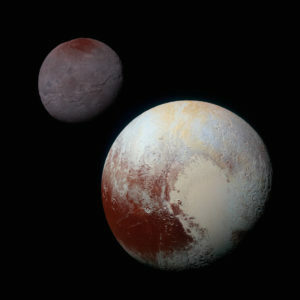 The final stage of the journey was extremely exciting and unpredictable in terms of the landing. 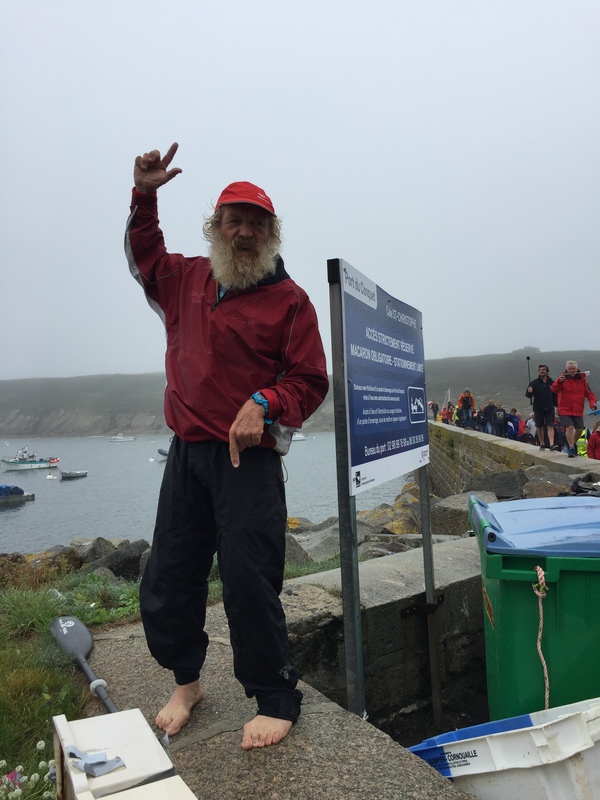 It was also extremely exhausting for Olek, due to the ocean and weather conditions at the time. One month earlier, Olek decided to change the place of his destination, which originally was Lisbon in Portugal, and decided to arrive in Le Havre, France. While he was already in the European waters of the Atlantic, winds began to bear him north to Cornwall, Great Britain. Circling between the islands of the Isles of Scilly, the waves threatened to crush “OLO” against the rocky banks. 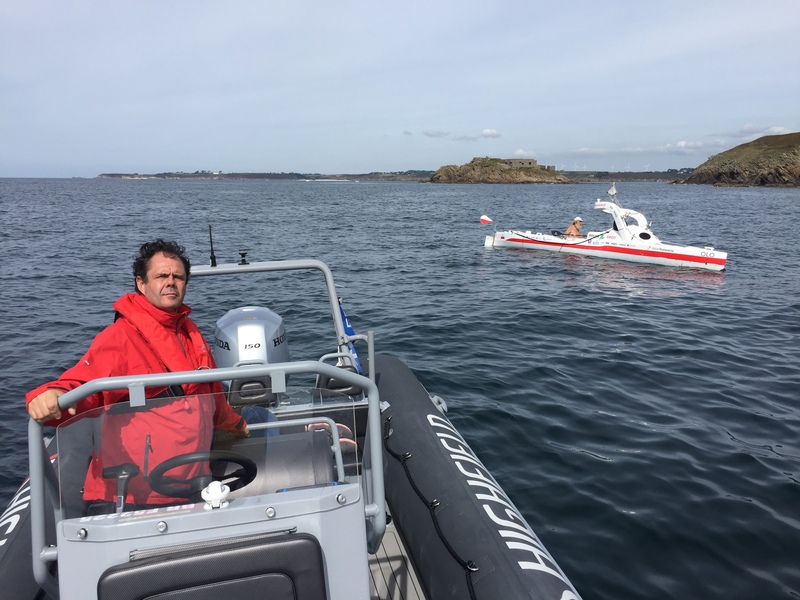 Piloted by the Harobour of St. Mary’s authority boat, Olek entered the waters of a calm bay to wait for favorable winds to proceed to the English Channel. Weather forecasts, however, were not supportive of his plan. At the Pointe Saint-Mathieu area, less than 30 kilometers from Brest, the sun is setting behind one of the islands that guard the entrance to the bay. This bigger one. In the horizon I see at least a dozen or so islands and islets formed by the boulders sticking out of water. 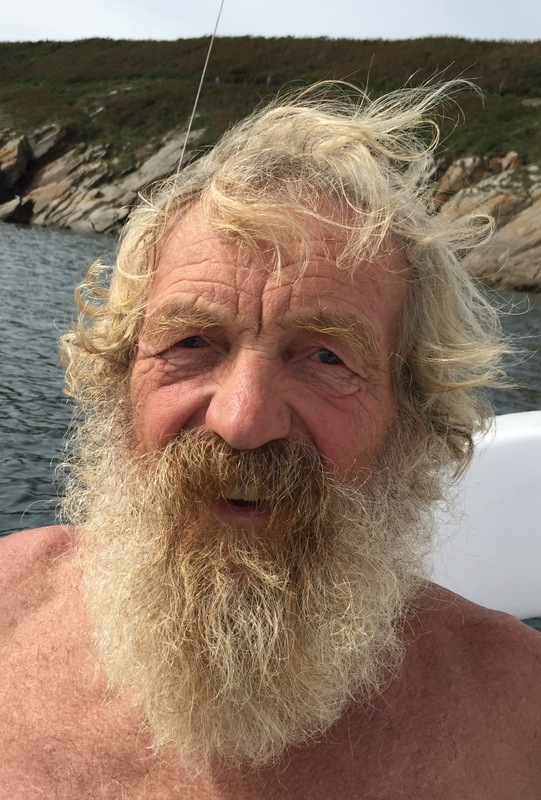 As Gauillame, the owner of a motorboat, which I used the day before to spot Olek said, each of them has more than one ship and more than one boat “on its conscience’. 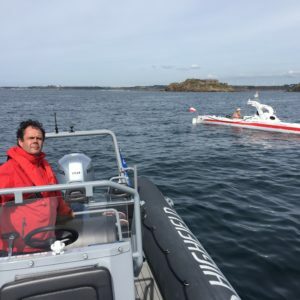 Nowadays, electronic navigation devices significantly reduce the risk of smashing against the rocks, but for a small vessel such as “OLO” it is still too real. “The wind is quite strong. I am afraid it will throw me at the boulders. I hid behind an islet that gives me some cover. In a few hours the wind should diminish slightly. I consider what to do in this situation”, says Olek on the phone. The light of the lighthouse and the specific shape of one of the rocks that we describe to each other over the phone allowed me to determine the location of his kayak. Through the eyepiece of the binoculars mounted on the ruins of the Saint-Mathieu abbey, I spot Olek, a little speck moving on the water that is imperceptible from this distance with the naked eye. It seems to be so close, but the difficulty of navigating in this area against unfavorable winds, is still making the distance so far away. “Olek, when the wind weakens, head south. Stay at least one kilometer from the mainland, because the shore is also rocky here. About four kilometers further there is a marina where you will be able to enter”, I scream to the phone. I shout, repeating the same message several times, because not only has Olek problems with hearing, but there is also a bad phone connection that is obstructing the communication. After a few attempts, I finally managed to connect with Olek at around 9:00 am in the morning. It is early afternoon at de Fort Bertheaume. From the top of the ruins of the old fort there is a magnificent view of the Atlantic and a bay enclosed within the rocky coast. Indeed, the weather is ideal, and is being enjoyed by the kayakers emerging from a nearby marina. Olek should come this way soon, very soon. But when? The message from a map of the SPOT locator again informs me that no updates have been made. I am checking Olek’s position on the portal of the MarineTraffic. Unfortunately, the wind carried him north, far from his destination. Again, his kayak is dangerously close to the rocks. 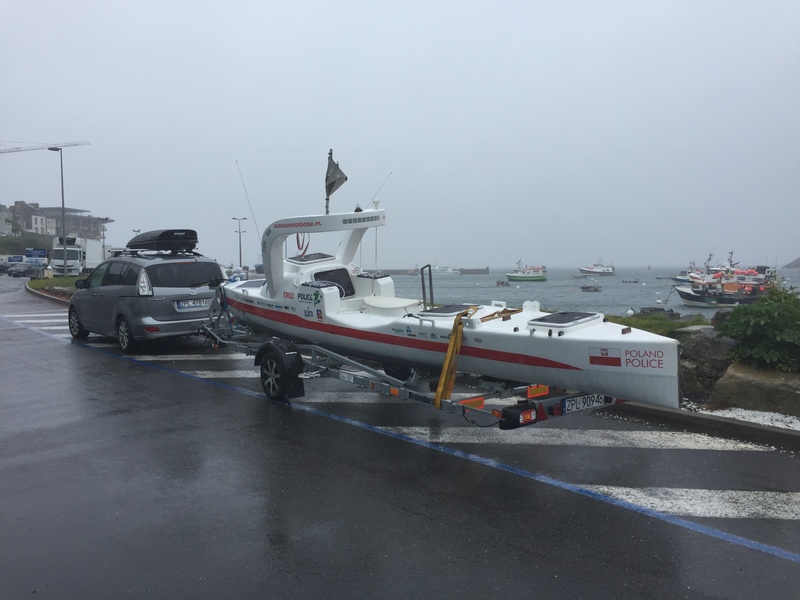 Together with Mark Jorand, media specialist for the Mayor of Brest City, we are taking a boat towards OLO’s location. Olek looks tired. 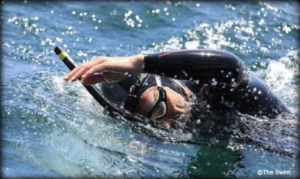 Struggling with the currents and the winds that push him toward the boulders has been exhausting, he admits. Brest unfortunately seems less accessible in these weather conditions, and the forecast for the next few days show that it will not get any better. “Olek, relatively close by is Le Conquet, a nice, historic small port town. Maybe you can paddle there and enter the land? Because of my concern for your safety, this is probably the best solution”, I suggest, looking cautiously at the kayaker. Olek does not give up easily, and when he makes up his mind, he usually holds to it. But usually he also shows common sense and altough his activity involves high risk, he calculates the degree of threat and his willingness to face it. “Le Conquet is already a continent. So … yes, at Le Conquet I will finish the expedition there”, he announces after a moment of deliberation. “Although I will not arrive in Brest, I am satisfied and happy. Finally I have crossed the Atlantic! Now, I will reach the port, but I will not step to the shore. 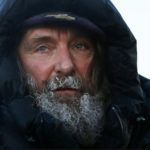 The official conclusion of the expedition with a first step on land will take place tomorrow at 12.45!”, he decides. 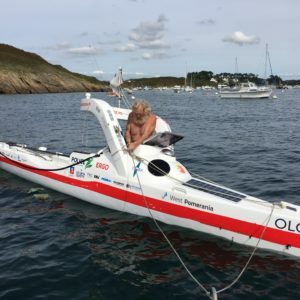 In silence, we look with Mark, as Olek proceeds to Le Conquet and sets himself between boats that are moored there, of which even the smallest one seems much bigger than OLO. It is amazing that he crossed the ocean in it! As a true engineer, Olek performs methodically all the activities needed to secure his kayak. “Done,” he cries at last. And it is the end of a great journey! Of the three expeditions, the last one along the North Atlantic route, as expected, was the hardest. Considering the date of its start, it has also been the longest. The launch took place on May 29, 2016, in the marina near the New York Statue of Liberty. Shortly after, in Sandy Hook bay, OLO crashed to the shore and the kayak was seriously damaged. In this situation, Olek decided to stop the journey. A year later he returned with the repaired kayak to the location where the accident occurred and on May 6th, 2017 he started again. And again, it did not happen without complications. While still in the bay a strong wind grabbed OLO, pushing it directly toward the rocks. At the very last moment, we were able to take him on tow; thereby avoiding crashing against the boulders. 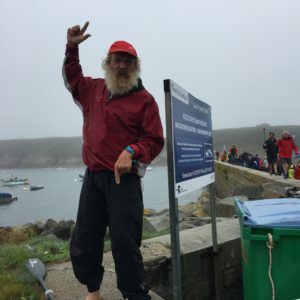 As soon as he happily paddled out into the open Atlantic, the threat of a storm appeared. 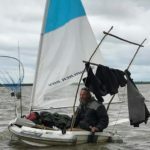 Since he had not yet been at least 150 nautical miles away from the shore, which is considered a safe distance in the case of opposing winds, he had to stop in Barnegat Bay, New Jersey, and wait for better weather conditions. 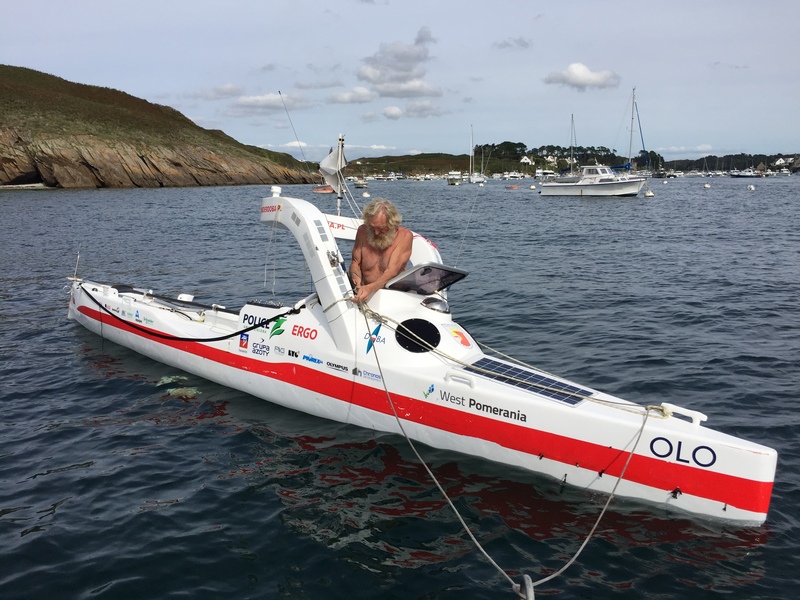 Even that short paddle in the ocean gave him a taste of what the next part of the expedition would look like: penetrating cold, high waves, and gusty winds that frequently changed direction. Later on, additional aspects of staying in this great body of water would challenge him – high salinity, huge empty space, loneliness, difficulties in communication and fatigue, affecting both his physical and mental well-being. The first weeks in the Atlantic passed on the battle against opposing winds, which were forcing Olek back, and he was spinning around or away from the Gulf Stream. This strong ocean current along with favorable winds and hard paddling was supposed to help the kayaker move east. In fact, as soon as he found himself on the Gulf Stream path, he took off sharply making even 100 nautical miles per day. Until, during one of the storms, OLO was seriously damaged again. The first assessment of the situation by the kayaker seemed quite clear. “With great disappointment, I say I have to stop the expedition because I cannot repair the control system,” he wrote from the ocean. Soon, however, he changed his mind, deciding to even drift for three months until he approached the Azores or unless help came. And help did come with the “Baltic Light”, a cargo ship that deviated from her course to Panama to reach the Polish traveler and whose crew helped repair the damaged steering system. As Olek will admit later, the expedition could continue only thanks to the action of finding the ship, on board of which the repair of one of the most important elements of OLO’s construction was possible. 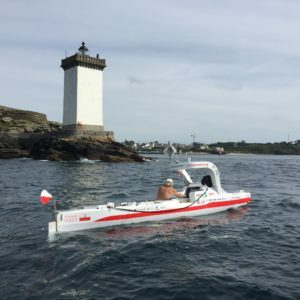 However, because of using that help of “Baltic Light”, had at the same time interrupted the chances of establishing a Guinness record in the category of a solo and unsupported crossing of the Atlantic in a kayak, for which Olek had really hoped. And then came days of threat. Olek was about 500 nautical miles from the European continent, when weather maps began showing an approaching storm of 8 to10 degrees on the Beaufort scale. Actually two storms. Olek had already survived many storms in the ocean during his current and previous expeditions, but none of them were as menacing as this one looked! High waves, mighty crests, collapsing and falling with all their power on the kayak, and gusty winds posed a great risk to the small boat, which was dependent on the kayaker’s experience although very much limited in such conditions, and at the mercy of good luck and the grace of Neptune. The first strong storm lasted two days; the second storm thankfully lasted only a few hours. Olek made it through both of them safely, though it was an exhausting ordeal. He arrived without much further difficulties near the Islands of Scilly off the Cornwall coast of Great Britain. Although the land was already within his sight, he did not want to end the trip on the islands. His goal from the very beginning of the expedition was to reach continental Europe. And so he arrived on the Brest shores in France. 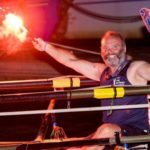 Olek announced that this was his last expedition across the Atlantic, recalling that the First Transatlantic Kayak Expedition took place in 2011. 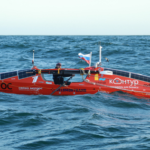 At that time, Olek followed the route of the shortest stretch of the ocean, which was between Africa and South America. During the 99 days of the expedition, he paddled from Dakar, Senegal, to Fortaleza in Brazil. And it was the only one of the three journeys that he completed solo and without outside support. 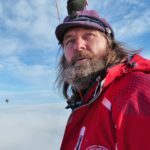 For the second expedition that set off in 2014, Olek selected the most distant points between Europe and North America. He began from Lisbon, and after 167 days he reached New Smyrna Beach, Florida. On the way, however, he stopped for a few weeks in Bermuda to make necessary repairs to a damaged rudder system. 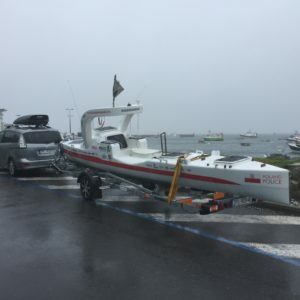 The last trip was markedly different from the previous two in terms of the scale of difficulty mentioned above and due to the nature of the route leading along the north side of the Atlantic, as well as the direction of travel. This time Olek was coming from the west to the east. Arriving from North America to Europe took him 110 days. As he promised his family and friends, he managed to get home for his 71st birthday!